Lori Sandler is a petite woman with short, spiky dark hair and an irresistible sparkle in her eyes. She speaks in calm, measured tones and frequently stops to smile and pause. If there were ever a single mom raising a child with significant special needs who exuded gentle wisdom in her whole being, it would be Sandler. Sandler has been a Solo Mom for the past 11 years. She has three sons, two who share her creative pursuits in the world and one who, if he has a magical inner life, keeps it to himself. That son, David, is 22 and looks a lot like his mother. He is also a gentle soul with a sweetness that draws people to him. “I like being around him,” she hears regularly from his caregivers. 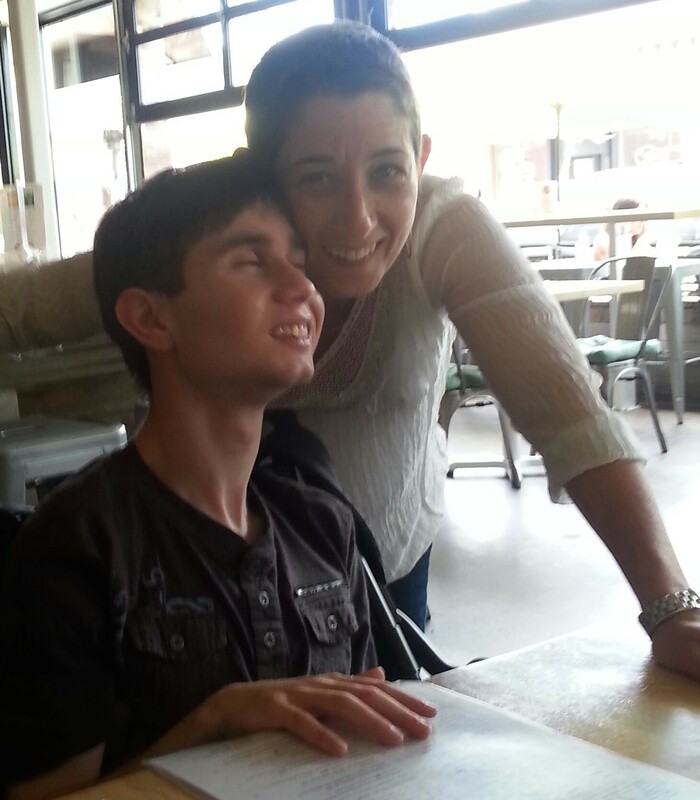 David has a list of diagnoses: he has a severe form of epilepsy known as Lennox-Gastaut, which for him includes an intellectual disability, and he also has autism, is nonverbal, and has no formal method of communication. He requires 24–7 supervision and hands-on help for every life skill, including eating, bathing, dressing, toileting, everything. But like all people with disabilities, David is more than his labels. He loves being in nature and taking walks. He loves music. The thing that always brings out his sly, sweet smile is being with his family. Sandler has changed through her life with David. When he was younger, she wanted to fix him, to cure him, and she felt that if she couldn’t, then she was a bad mother. “I used to think that caring for him was a burden,” she admits. “I felt victimized by his enormous needs. She also says she could see how loving and present she was when she sang to him while giving him a shower. She became a really good cook because she wanted him to have the healthiest foods she could make. She let go of her frustration and judgment, and chose to see the love and dedication she gives David every day. Sandler realized she had choices. She could feel like a victim. She could obsess over how she cared for him, feeling guilty for not living up to some gold standard of care. She could put him in an institution and let others care for him. Or she could open herself up to living an unpredictable and honest life caring for her son, with some days harder to accept than others. Sandler has some advice for other Solo Moms with complex children like her sweet son. “The most important thing is to know that it is all really an inside job. How we feel and live is all a choice.” She has learned to take a long view of life and to expand her perspective in all situations. She even found help raising her son from her teacher at the Trinfinity Academy, an online school that focuses on helping people find enlightenment and empowerment. She is a writer and blogger, and is working on her own spiritual teachings. Thankfully, we can all learn from her journey. If you are a Solo Mom raising a child with special needs, join our closed Facebook group ESME Special Needs for support and connection. Or check out our Sisters Only on the site.